I want to cook for a new client. I want to go to Greece, Jerusalem, Turkey, India, etc. I want to be a size __. I want to weigh __. I want to book a voice over job that’s creative and challenging. And then as opportunities presented themselves, I would ask myself, “Lisa, is this getting you closer to what you want or is it taking you in a different direction?” Opportunities are choices, so…Invariably, I would choose the thing that got me closer and reject the choice carrying me away from what I wanted. My actions were in alignment with my goals. Goals were set and met in record time. I was a First Class accomplisher. Why? Because I remembered what I wanted at all times. I had discipline. I had a strong desire. Somewhere along the lines of living my life and watching my 30s ooze into my 40s, I stopped remembering my wants. My discipline had deserted me. I got comfortable with what I had, or got complacent (or something) with the results yielding from my uninspired choices and half baked efforts. Or maybe I began to manipulate and justify my wants and convince myself that my wants were actual needs. Bad. News. Bears. I was given a little book by the wife of Charles Lindbergh, Anne Morrow Lindbergh, called Gift From The Sea. It was written in 1955, but you’d think it was written this year, the wisdom is so timely. Anne breaks down needs and wants in a really sweet way and talks about how we can shed pride when we stop carrying what other people think about our ‘things,” and keep life simple by just meeting our needs. I like that. So much of what we do, so much of what we accumulate, is to impress another, to appear a certain way, or to prove something to someone, right? What a relief to not care about the opinion of others! Anne also makes a really valuable point about our wants too though. She says we collect material possessions not only for security, comfort, or vanity, but for their beauty as well. In my spiritual community there is a big emphasis on not attaching ourselves to material desires. Material desires being land, money, anything outside our marriage, acclaim, anything bringing us sense gratification. We work for our desires to please God. For our desires to bring us spiritual advancement. This is something my friends and I struggle with a great deal. We have good practices, we are good people, and then we find ourselves wanting the THINGS. So I haven’t cleaned up all areas of my life, I’m still human. My desires often get the best of me. Daily, I have repetitive periods of 'I need to be doing that, but I want to be doing this.' Or 'I need to be here, but I want to be there.' I still make choices that might make someone on the outside look in and say, “How can wanting that possibly be good for you?” To them I say, ‘This adds so much beauty to my life, I couldn’t bear to do without it.’ Sometimes beauty has more value than anything else, even discipline. Not that health and wellness means that we should only eat salads, but it’s nearly summer, I hope you’re all taking advantage of the seasonal produce and the bounty available in gardens and farmer’s markets! I love a salad because that means I’m not turning on my oven. This is one of my favorites to make in the summer months. Pickling fruits and vegetables is not a new idea. It is actually a very old one dating back 4000 years, when travelers needed to preserve their food for long journeys. It’s an exciting way to bring texture and elevate the flavors to certain dishes. The recipe below would be great with pickled cherries as well. Method: Warm vinegar, sugar, salt, and water in a medium pan until sugar and salt dissolve. Place blueberries and onion in a jar and pour pickling liquid over them, cover and secure with jar lid. Refrigerate overnight before using. 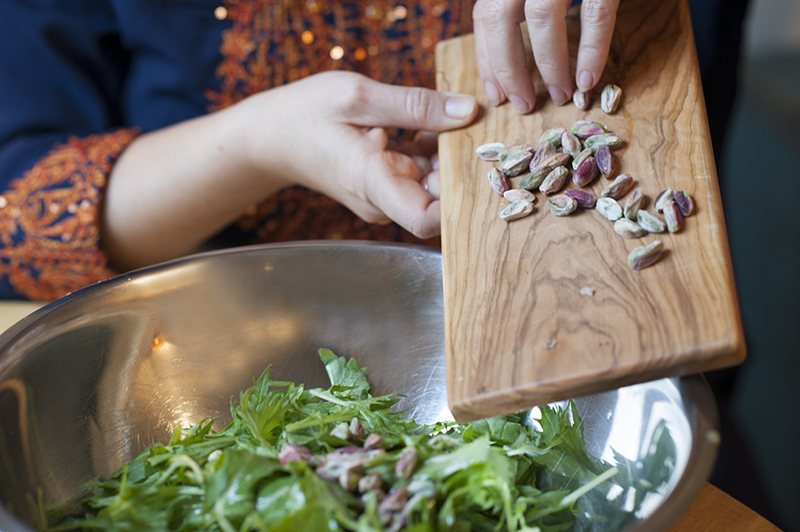 Fish out a handful and toss over greens with pistachios and Ginger dressing. Shake all ingredients in a jar secured with a lid until fully combined. Photographs of food by Cheryl Stockton of Stockshot Studio.